Not sure anyone here is interested but here goes. 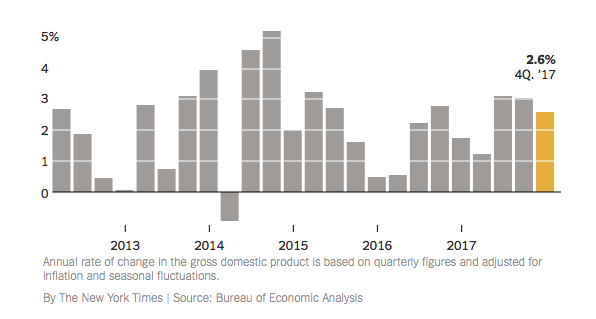 Growth has been good but not remarkable in 2017. Yet our President take every opportunity to remark about it. Truth of the matter is that President Obama Is Handing a Strong Economy to His Successor. As far as the stock market, it has gone up faster under Trump. In 2017 growth was 34.0%; in 2016 growth was 20.6%. I will give him that and it is due to his deregulation and corporate tax cut - promises of a better environment for business. The market is based on speculation, thus it has gone up faster. But it helps primarily the investor class and beware of deregulation especially in the financial sector. So in summary, stock market growth is up (good for the rich). Job growth is down (bad for all classes). GDP growth is about the same.